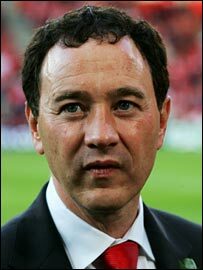 Middlesbrough chairman Steve Gibson has revealed his blueprint for a new boss as he seeks a successor to Steve McClaren at The Riverside. McClaren will take over from Sven-Goran Eriksson as England coach after the World Cup in Germany. Terry Venables, Martin O'Neill and Alan Curbishley have been mentioned as possible successors to McClaren. Gibson said: "We have got to pull a manager out of the top drawer. We have got to make it a seamless transition." Crystal Palace boss Iain Dowie has also been touted as a possible target for Boro, and Gibson said: "We have so many good things going for us, to help us move forward again." Gibson went into the dressing room after Boro's Uefa Cup final defeat against Sevilla in Eindhoven to console the players and point the way forward. He said: "I went in after the game because it was important that we should stick together, especially at a difficult time. "With Steve leaving it was really up to me to be the authority, to thank the players and keep them informed about what was going on. "Yes, it was a Uefa Cup final and yes, we would have wished to have won it, but we haven't and we have to move on."